I’m pretty sure I spend most of the year waiting for blueberries to be in season again just so I can throw them into any and every baked good that comes out of my kitchen. I know I could just use frozen berries, but I feel like part of the fun is being able to enjoy things for seasons at a time. I’ve got a few cans of pumpkin puree hidden at the back of a cupboard somewhere, but I wouldn’t dream of opening it until at least September. Gotta keep those Fall feels in the Fall and these Summer vibes in Summer. You know? 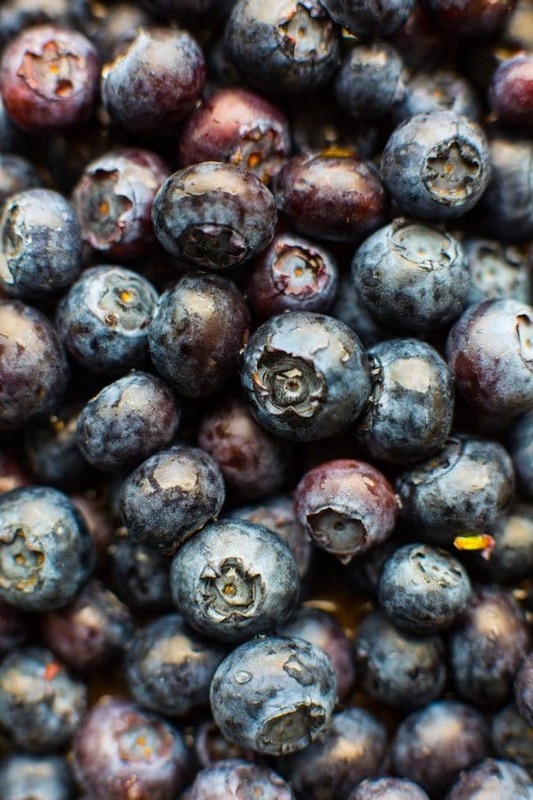 So from now until pumpkin season – let the blueberry baking begin! You don’t even want to know how many failed gluten free vegan scones recipes I’ve sorted my way through. In fact, about this time last year I was itching to post a dairy free/egg free scone recipe, but it just never happened. I get close, but then after so many attempts I just can’t bring myself eat another scone for fear of not being able to fit in my jeans. Not cool. You have to chill the dough before baking. If the coconut oil isn’t cold enough in the dough your scones will end up spreading too much while baking. Full fat coconut milk works best here. If you want a full refined sugar free scones you can always grind up some extra coconut sugar to make into powdered sugar for the glaze. It also adds a really gorgeous, caramel-y type of flavour! However, if you do end up with leftovers that you want to enjoy later in the week just revive these in the microwave for about 20-30 seconds or on a low heat in the oven for a bit. Good as new! Don’t forget to #asaucykitchen on instagram if you try these Vegan Gluten Free Blueberry Scones! We love seeing what you make! You can also post your pictures to my facebook page! Whisk together the flour sugar, baking powder and salt together in a large mixing bowl and combine. Add the coconut milk to the bowl and stir until a soft dough forms. Fold in the blueberries. Prep times includes 30 minutes of chilling the dough. If you use xanthan gum just mix it in with the rest of the dry ingredients. If you use psyllium husk mix it into the coconut milk and let sit for a couple of minutes before adding the coconut milk. Can you try making one without cant handle gum please? Hi Raphael! I haven’t tried this out myself in this particular recipe but cornstarch can be used as a gum replacement. I followed this recipe exactly as written but the inside came out doughy and the taste and texture were not at all scone like. I tried baking it longer but that only left the outside dry. Perhaps it was the flour blend I used- a non gluten blend with xanthan gum. Hi Van! Sorry to heat these didn’t come out for you! It’s hard to say what might have gone wrong without being there. It’s possible that the flour blend could have been the problem as you’ve mentioned. I’m also wondering if maybe your oven might be calibrated a little differently than mine which could have affected the cook time. If you were to try them again I might recommend lowering the temperature and cooking them for a longer time. Also make sure that the scones are baked in the centre or lower part of the oven. If they were too high that could make for a dry outside but uncooked inside. These were great! I was short on time so I put them in the freezer for 15 minutes. I also replaced the sugar with 2 Tbl honey (and reduced the milk by a few teaspoons). Thanks Katie! Super helpful to know about the honey too – I get a lot of questions about sugar subs! Hi Sinead! It’s hard to say without knowing the percentages in the flour blend. I’d still include baking powder because these scones need a lot to rise but the full tablespoon might be too much. If it were me I’d try it with 1 – 1 1/2 teaspoons. I think that will work. Hope that helps! For the blueberry gf/ vegan scone recipe substitute other berries? Hi Lynne! You should be able to use any berries you like here! These were unbelievable! I’ve been looking for a good vegan/gf scone recipe to use up an excess of fresh cranberries. I subbed cranberries for blueberries, and added in almond extract and orange zest. They came out perfect! Ooh love those changes! Thanks so much for coming back and leaving a review – I’m so glad you liked them! Can you freeze the “dough” and then make on demand??? I’ve neber tried freeze coconut oil and coconut milk. I made these scones today. They taste good and came out nice and brown. However, when I added the coconut oil, the mixture was crumbly so when I added the milk, the batter was lumpy. I added the blueberries, but because the mixture wan’t smooth, it was hard to pat it into a round without smashing the berries. What do you think I did wrong? Hi Donna! The dough should be crumbly/sandy after adding that coconut oil so so far that sounds right. What was the temperature of the coconut milk like? 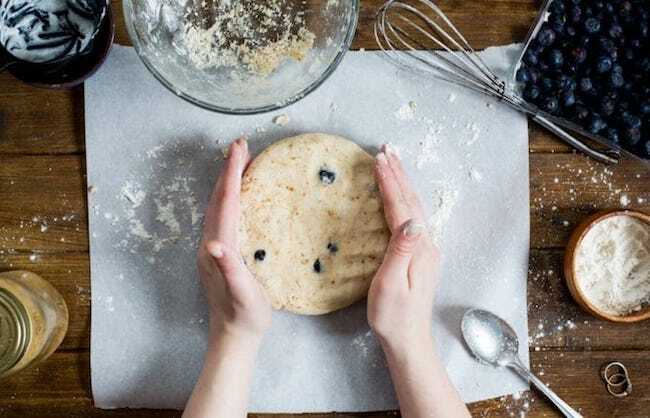 If it was too cold/refrigerated that can sometimes be a little more tricky because it makes for a much stiffer dough which would have also have made the blueberries burst a bit. The good thing is that is sounds like it didn’t really affect the outcome of the scones much except for the fact that the blueberries might have been a little smashed. It’s been somewhat of a challenge since we’ve gone Gluten, Eggs, Dairy free BUT you saved us again!! Thank you!!! PS .. when you say leave at least 2 inches between, when baking, you mean it!! I was moving them apart after they baked at bit. Sarah, I am a sconaholic so when I started eating vegan and gluten-free I was consistently disappointed with the offerings of scones. I love to go for afternoon tea so would call ahead to inform the restaurant of my dietary preferences. My favorite part of afternoon tea are the scones. I always left feeling unsatisfied. I started scouring the internet for recipes. Some adequate, others good and then I came across your recipe. It is by far the best scone I have ever had. This includes classic scones with dairy and regular flour. These are magic. I live in the UK and my husband is British and he told me this morning these are indeed the best scones he has ever had. The only thing I would like to point out is it states in the recipe the cuisine is American – Scones I believe originate from England, Scotland and Ireland. Maybe this could be explored? Sarah you are a goddess for creating this! Hi Anna! That makes me so happy to hear. I’m really glad these got both of your seals for approval! Thank you so much for taking the time to come back and let me know what you guys thought! As for the cuisine – I listed them as being American because these are more like American style coffee shop scones as opposed to traditional British scones. I can’t have coconut. 🙁 Can I sub the coconut oil for veggie shortening or vegan butter? And soy yogurt for the Coconut milk? Thanks! Hi Katie! I can’t say for sure because I haven’t tried it with those substitutes but I’m almost positive that they would be just fine! When using the full fat coconut milk, should I whisk the solidified fat into the milk before using in the recipe? TIA! Hi Deborah! Yeah if the solids are a little chunky that would be a good idea. Hope you like them! Hi! Just wondering if you used unrefined or refined coconut oil? I want to make these for my dad for Father’s Day! Hi Merry! I use unrefined coconut oil. So long as you use coconut oil that has the ability to solidify when it’s cold enough you should be fine though! One more thing…if you want add in the lemon zest, how much do you recommend and does any other part of the recipe change? Baked them as is, but would love a sugar alternative! So glad you liked them! I haven’t yet tried with honey/maple but I am wanting to play around with the sweeteners myself – I’ll update this one when I do! I used maple syrup and it worked out fine! That’s super helpful to know – thanks Betty! As for your other question about freezing the dough – I have yet to try it with this recipe specially but I do think it would work, though I can’t say for sure. I think you’ll probably just need to bake these for longer. If you try it out let me know! I’m away visiting family for Thanksgiving so I’m without a kitchen to test it in but when I do I’ll update the post! I have never left feedback on an online forum in any shape or form, but these scones compelled me to leave a message. I baked these for a community tea ceremony tonight. They were so good! Everyone was blown away. And I love how they cater to multiple dietary preferences. Such a crowd pleaser, thank you for sharing! What’s the substitute for the gum or the husk please?! Would a little chia flour or flaxseed meal do the trick? Hi Pakinam! I haven’t tried these scones with chia flour or flaxseed meal yet so I’m not sure how it would change the recipe. You could always try just leaving out the gum/husk. I’ve made these once without using any binder – they did come out a little more crumbly but still good altogether! Hi, firstly I would like to say these sconces are one of the best ones I made so far! Thank you Shea! Little late reply… But yes I used grounded chia seeds instead of gum n husk. It worked perfectly fine n it is nutritious too. I just added directly to the flour but can mixed it with some cold first. These were absolutely amazing! I had no idea gluten free could be even better than regular. Scones are one of my favourite things and I. So happy I don’t need to give them up! Thank you thank you thank you!!! That makes me so happy to hear – I’m really glad you enjoyed them so much! Thanks for coming back to let me know what you thought! Hi! Do you know if Gluten-Free Bisquick Mix would work for this? I don’t have an all-purpose flour like Bob’s Red Mill or anything, but I have a ton of that mix! 😀 I’m soooo looking forward to trying these! So glad you liked them! Thanks for coming back to let me know what you thought! Could I use regular all purpose flour? I don’t have gluten free at the moment and what would happen if the coconut milk is not full fat? Just made these with ingrediens on-hand. Bob’s Red Mill all purpose gluten-free flour, xanthan gum, frozen blueberries, organic sugar (huge bag from costco that I use to make sugar scrubs for the shower) …woke up this morning to the first snow of the season in town and was craving some comfort food for breakfast. These are delicious!! I will def make them again with cranberries and the powdered sugar/maple syrup sauce on top. Great job!! even my boyfriend who is NOT gluten-free said for the first time EVER “these are really good” It’s a win. Hi! 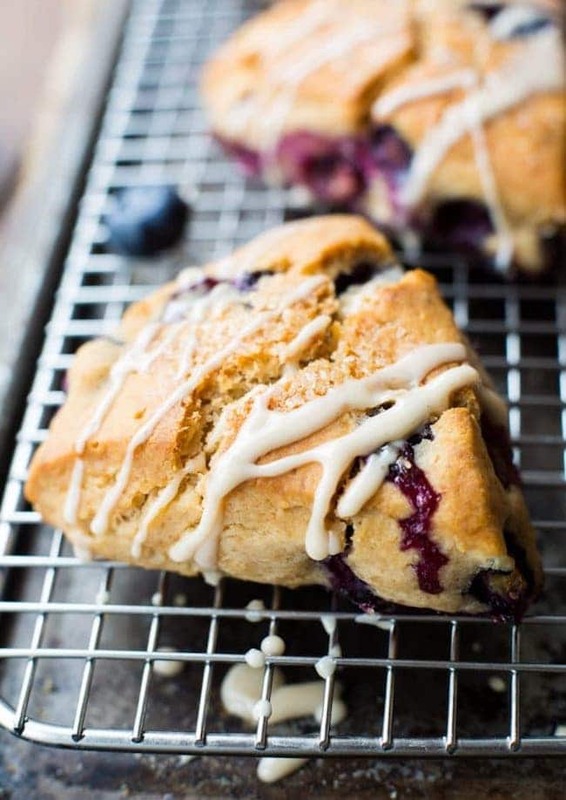 I really want to make these since I have been having a major scone craving! I can’t eat a lot of certain food items due to breastfeeding a child with multiple food sensitivities but this recipe looks safe! Would I be able to use frozen blueberries? Would that affect baking time or liquid used? Could I use Earth Balance vegan butter instead of the coconut oil? Hi Chassis! Frozen blueberries will work! You might just need to add an extra minute or two to the baking time. Earth Balance will also be perfectly fine here! Just make sure that it’s cold when you add it like you might do with normal butter scones. Hope you like them! Haven’t baked yet but am freezing it solid first. How much longer will they take to bake approximately? Hi Dana! I haven’t tried baking from frozen myself, but according to what I’ve found online it sounds like you might need an 2-3 minutes at most! These are yummy, one of the better GF scene recipes I’ve made. This may be it! I made mine with blackberries. Next time I’ll try your lemon blueberry. HOWEVER, these were still doughy in the middle even though I baked them 25-26 minutes. Any suggestions? I love scones and don’t want to give up the better things in life being GF! Yay! So glad you liked them! We’ve got blackberries growing in our garden so now I’m looking forward to throwing them into some scones! As for the doughy centres -a couple of things. How doughy were they in the middle and how were the tops of the scones when you baked them? If they weren’t starting to brown too much on top I’d suggest just to just let them bake longer. Fresh fruit can sometimes add a little too much moisture to baked goods – if the blackberries were really juicy that might have had an impact on the dough making them need more cook time. Hope that helps but free to come back if it still doesn’t add up! Thanks so much for coming back to leave a comment/review! These look delicious. Do you think I could leave the dough in the fridge over night so I could bake them in the morning? Yeah that’s totally fine! Just make sure you refrigerate in ready to cut or already in triangles otherwise the coconut oil might be too cold to shape easily in the morning. Those look amazing! I’d love it if you shared this on the What’s for Dinner Link up! You are speaking my taste buds’ language! I’m a sucker for anything blueberry and have been addicted to scones lately, so this came at the perfect time! You and me both! 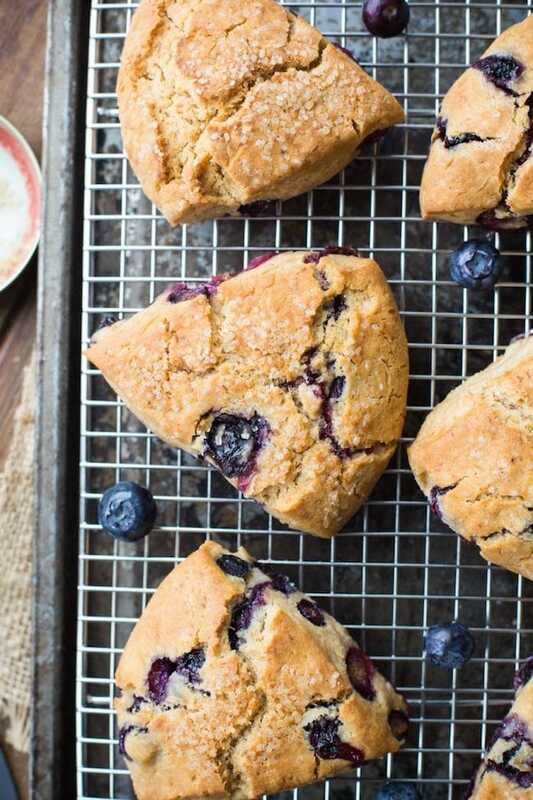 I can’t help myself when it comes to blueberries in baked goods – they’re just too good! Hope you like them!